The nut is the fruit of the walnut, of rounded or ovoid shape, with a hard wrinkled shell of a reddish-brown colour. The edible part inside it has a particular sweet taste. In the market there are unshelled nuts, cut up or ground; there are also several products processed from them. The edible part of the walnut resembles the shape of the brain and, thanks to its content in vitamins of the group B, they are good for the memory. Moreover, they reduce the risk of heart attack and the levels of cholesterol in the blood. People with high blood pressure or diabetes are allowed to eat them. The nut is the fruit of the walnut, of rounded or ovoid shape, with a hard wrinkled shell of a reddish-brown colour. The edible part inside has a particular sweet taste. Walnuts are usually consumed raw as a snack or dessert, on their own or combined with other foodstuffs. It is used as an ingredient in many dishes, sauces and ice creams. In the markets they sell whole walnuts, cut up or ground with a flour texture. Apart from being one of the most appreciated dry fruits thanks to its pleasant taste, it is also one of the richest in oil content, reason why they are used to obtain this substance. The walnut oil has a sweet and pleasant taste. The unripe fruit is used for manufacturing the so-called "Ratafía’ liquor and the walnut leaves are used to prepare infusions for external application. Walnuts are very nutritious, with a high energetic value, 662,5-688kcal/100g and, among the vitamins found in walnuts, the most important are those belonging to the group B, among which the folic acid stands out. 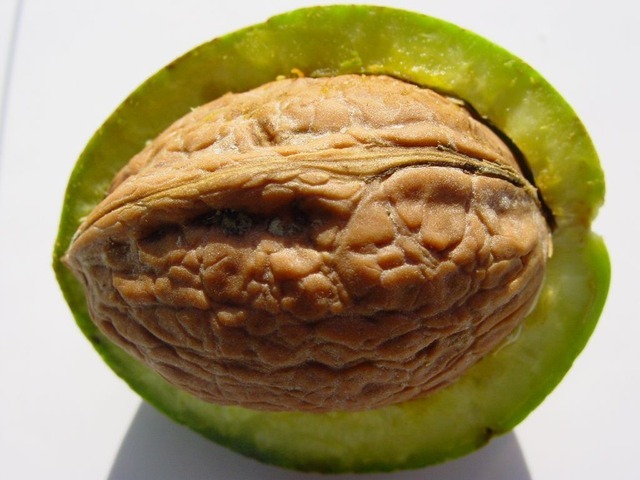 The walnut is the fruit of the walnut tree or Persian walnut, although the word " nut" is also applied in a generic way to all the fruits that have an edible seed in a hard shell. The walnut is a rounded or ovoid fruit, according to the variety, with a hard and wrinkled shell or mesocarp of reddish-brown colour, that is formed by two valves, divided in two or four sections that contain the kernels or endocarps, of irregular shape, light yellowish colour and covered with a thin brown skin. 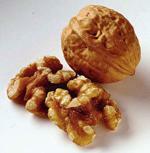 They occupy almost all the capacity of the fruit and they are the edible part of the walnut. They have a sweet taste that remains in the palate some minutes after their consumption. The walnut is mainly marketed with shell. The demanding consumer searches for large size walnuts, tasteful, well-dried, with 10% of moisture content and healthy. If they are of small size, they are used to decorticate and the kernel is mainly intended for confectionery. According to the colour of the seed, somewhat pale, and the taste, we distinguish different varieties although they do not all have the same acceptance. The walnuts with shell are usually preserved for 2 or 3 months. The decorticated ones must be kept in cold rooms in order to slow down the rancidness process; they may last for approximately 6 months. It is also possible to freeze them, with or without shell. The tree that produces this fruit is commonly known as walnut tree and it belongs to the family of the Juglandaceae. It is the most cultivated species of Juglans regia in Europe. It is very vigorous and it may reach 30m of height, it has an erect habit during the first 40 years and afterwards it is hanging. It is a deciduous tree, of rounded and elevated crown, branched and elongated. The trunk is straight and covered with a grayish and thick bark; the young branches are dark red and the old ones are cracked and brown. The root system is pivotal, with a development in the surface of horizontal roots; both the horizontal as the vertical roots are widely spread. The leaves are large, imparipinnate, of an opaque green colour, glabrous, with a strong and unpleasant smell, quite rich in tannins, as all the other parts of the plant. Each leaf consists of 5 to 9 oval leaflets called folioles, which are generally whole, with standing out nerves on the reverse, a short petiole, practically opposed one another, 6 to 12cm long and 3 to 6cm wide. In the walnut tree we can distinguish masculine and feminine flowers. The masculine flowers are arranged in long catkins, of 6 to 8cm, frequently isolated, of brownish green colour and inserted in the superior part of the small branches born during the previous year. They are free of leaves during the flowering. The feminine flowers are solitary or in groups of one to five, in terminal spikes.